Phumudzo Maphaha previously presided over the Tongaat mall collapse inquiry and the Meyersdal structural collapse inquiry. The Department of Labour’s chief inspector, Tibor Szana, today announced Phumudzo Maphaha as the new presiding inspector over the Grayston Drive pedestrian and cyclist structural bridge collapse inquiry. Maphaha will take over from Lennie Samuel who has been presiding since the inquiry was set up. Szana said Samuel has unfortunately taken ill and is no longer in a position to continue presiding over the inquiry. “I have subsequently appointed Mr P.O. Maphaha as the presiding inspector to take over from Mr Samuel due to the gravity of his illness,” Szana said. Maphaha previously presided over the Tongaat mall structural collapse inquiry and the Meyersdal structural collapse incident inquiry. The Grayston Drive pedestrian and cyclist structural bridge collapse inquiry was announced by the Department of Labour in 2015. The Section 32 hearing was set up to investigate negligence that may have resulted in occupational injuries and deaths of people. 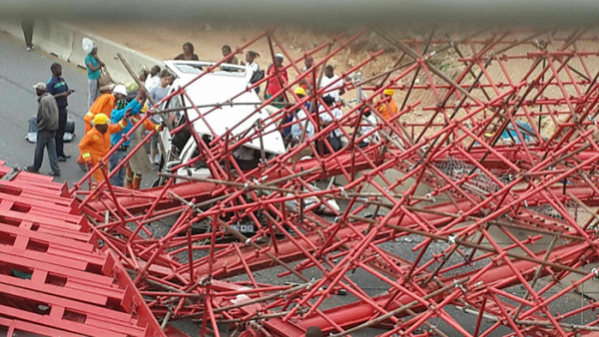 On 14 October 2015, a pedestrian and cyclist bridge under construction on Grayston Drive in Sandton collapsed on the M1 highway, leaving two people dead and 19 others injured. The inquiry had its first sitting in February 2016, with the last sitting held on 27 September 2017. The inquiry has been postponed to July 2018.